There is, almost literally, a cookie out there for everyone. From casually thrown together drop cookies to carefully rolled out, cut out and frosted cookies, you can find a cookie recipe to suit every level of baking skill, every available time frame and every taste. This is why cookies are so popular, and it is also why there are so many cookie cookbooks out there. We just can’t get enough (I know I can’t!). 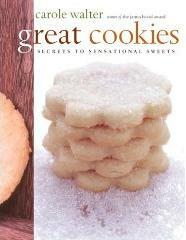 Great Cookies: Secrets to Sensational Sweets is a cookie cookbook from James Beard award winner Carole Walter. It breaks cookies down into 11 different categories and offers up over 200 cookie recipes to fit all cookie preferences. The book covers many basic cookie recipes, such as Oatmeal Raisin and Soft and Chewy Chocolate Chip Cookies, but definitely takes care to include many more unusual recipes. There is a chapter dedicated to international cookies, as well as a good sprinkling of nonstandard recipes throughout. Each of the recipes starts off with a description of the cookies before getting into the details of how to make them. Every recipe also includes a list of “cookie characteristics,” which can be extremely useful when picking out cookies to ship, store or even just to give away. Characteristics include traits like versatile, fragile, long/short shelf life, festive, travel well, etc. to name just a few. After the recipes, there is a section that goes into detail about ingredients, equipment and techniques entitled “ecrets for sensational cookies.” This is a great resource for those just getting into baking, but it might be an even better one for more experienced bakers. It goes into great detail about choosing, storing and using various ingredients and even includes a section that compares the properties of several different brands of chocolate chips and chocolate bars! The photos throughout the book are lovely, too. Overall, the book is a great handbook for cookie bakers and one that, if you don’t turn to it as a reference, will give you some great information as you read through it and try some of the recipes. This is a fabulous book. i have all of Carole’s books and they are like my children…i just can’t name a “favorite” one. I love them equally. Her latest Great Coffee Cakes is an incredible publication as well. I only have one of Carole’s books..but useful indeed!